Welcome to SEC Consulting, LLC. 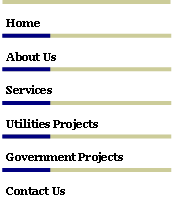 Since founded in 1999, SEC Consulting, LLC has developed a proven reputation for successfully delivering professional services to the utilities and local government sectors. We provide consulting services that lead to practical and meaningful solutions to the technology, business and operational problems faced by utilities and governments. We bring leadership, practical experiences, and a commitment to success to all our challenges. SEC Consulting has been successful in engagements that include system evaluation and selection, business analysis responsibilities, system implementation management, and project quality assurance assessments. SEC Consulting clients include various types of utilities, local and municipal governments, and system integration companies. Copyright ã 1999-2009 SEC Consulting, LLC - All rights to the contents of this website are reserved. All trademarks referenced are property of their respective owners. 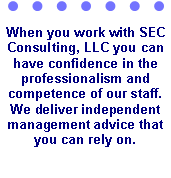 SEC Consulting takes great pride in the number of clients that have repeatedly used SEC Consulting services.